This is Arcam’s top-of-the-range FMJ CD/SACD player and it’s a cracker! Arcam has recently revamped its entire flagship FMJ range. First seen at Munich's High End show, the line-up has something for everyone in terms of both specification and price. At the very top of the CD player range, is the subject of this review; the FMJ CD37, an SACD-compatible disc spinner that reflects all of Arcam's CD player know-how in one box. Arcam's decision to include SACD compatibility is intriguing, as the format hasn't quite been the success story Sony hoped for, but Arcam's brand manager Geoff Meads points out that SACD disc sales are buoyant outside of the UK and reminds us that it is, of course, an audiophile format and this is an audiophile product. Point taken. The new range-topping machine has benefited from a lot of the development work seen in Arcam's DVD players. 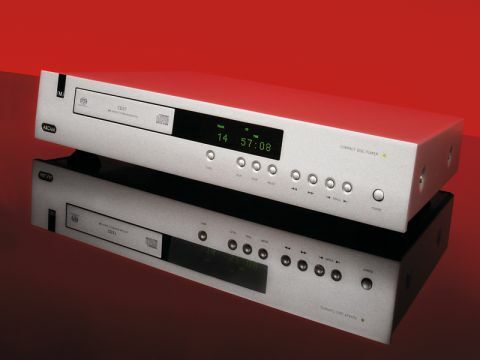 It also directly replaces two models; the DiVA CD192 and the FMJ CD36, taking the top spot in digital audio. It's turned out in the usual Arcam 'FMJ' style, with a smart dot-matrix display that's a little different in style from recent Arcam CD players as it displays text when SACDs are loaded (the manual claims it also displays CD Text, though we couldn't persuade it to). It still occupies the same amount of panel space as the old ones, though and the button layout is the same, too. And yes, Arcam stays in our good books for including both track skip and fast forward/back buttons! Functions beyond the basic transport controls do require the remote control, which is Arcam's new CR90 model, a multi-function learning remote capable of controlling multitudinous components including those from other manufacturers. That said, there aren't many functions on the CD37 – layer change on SACDs (in the unlikely event you ever find a reason to do so! ), display mode switching and the usual track programming functions are about all. Looking under the lid, nothing immediately jumps out as unusual, though there are some interesting features. The transport itself looks indistinguishable from a normal CD one and the output circuit, with its high-quality op-amps and passive components, could be from any respectable digital audio player. Arcam has picked one of the latest DAC chips, a Wolfson 8741 part which handles both PCM (CD) and DSD (SACD) datastreams, with very impressive specifications. These days, the DAC invariably handles most of the filtering function, which is essential to the operation of any digital audio device and, as such, has to be the single biggest influence on the sound. Wolfson has provided the chip used in the CD37 with several different filtering settings and we feel that Arcam may have missed a trick in choosing the default one when another was available with much lower aliasing in the transition band. The benefits of this may not be vast, but with CD player performance nearing theoretical perfection, every little helps! The other irony of the DAC is that, like most modern parts, it is a 'multi-bit delta-sigma' type internally, which means that it converts both PCM and DSD datastreams into what is effectively a middling format before final conversion to analogue, thus losing the conceptual simplicity of pure DSD. Arcam couldn't have done anything about that, though, and most SACDs will have been recorded through a similarly convoluted digital path. For the rest, the internal construction is very good, with separate toroidal transformers for analogue and digital circuit sections and extensive screening, including Arcam's 'Stealth Mat' metal fibre screening, ensuring solid grounding between chassis and lid and extra electromagnetic screening on key components. Twin analogue outputs and both flavours of digital output, complete the thoughtful specification. Mechanical noise is distinctly lower than from many players we've tested recently and disc loading time is reasonable – actually, by the standards of most SACDs players, is excellent. We expected good things from this player, having not had a bad Arcam disc spinner in many years, and we weren't disappointed. That sentence, of course, highlights the risk of preconceptions and, aware of that, we set up an informal blind test against a couple of familiar CD players, which confirmed that this is a highly capable machine. Its basic sound is clear, extended and unfussy, with detail served up tastefully – never thrust at the listener. Having said above that CD players are approaching theoretical perfection, it's surprising how they still seem to differ sonically. Differences are seldom night and day (barring the odd, wilfully different design), but can still become quite obvious after a bit of listening to familiar tracks. Rather than substantial changes in tonality or level of resolution, what we tend to find is subtle changes in emphasis, one player perhaps giving a touch more importance to rhythm, say, while another favours lyrics or high-lying melodies. In this case, the most favoured region seems to be the bass and lower midrange. We hasten to add that there's no suggestion in the sound of excessive level in that frequency band, no added richness or loose, woofy overhang. In quickfire comparisons with other players (and with high-end external DACs fed from the CD37's digital output) we could detect no coloration in that or any other region and yet every time we simply sat back and listened for a few minutes we felt that our attention was being subtly drawn towards lower-frequency sounds. There is indeed a richness, a sense of luxury, to the bottom octaves which couples with the CD37's generally excellent detail to make bass lines easy to follow, even when the midrange and treble are very busy and we found this immensely attractive across a wide range of music. What makes that even more appealing is that there seems to be no compromising lack of quality in the upper octaves – or hardly any. Perhaps, in the very highest treble there's a hint of grain and less openness and air around the sound than the very finest digital replay can provide (we're thinking seriously high-end here), but it must be said that few if any sub-£1,000 CD players can exceed the performance we felt the CD37 provides in that area. Midrange is exquisitely detailed and stereo imaging is precise in both dimensions, with very good extension, too. So far, we haven't specified whether we're talking about CD or SACD quality, on the whole, of course, we're referring to the former, mainly because we (and almost all potential CD37 purchasers) have a lot more software, and more points of reference, in that field. SACD comparisons are slightly trickier, but we do feel that this player is one of the best we've heard at avoiding the slightly 'ethereal' quality which has, for us, subtly undermined the appeal of some SACD players. Here, the sound is full-bodied and well grounded – that charming bass clearly doesn't hurt, but the treble seems unusually well integrated with the rest of the range. As for the comparison between CD and SACD layers of the same recording (when it's fair, i.e. when both are at the same level and have the same equalisation), it does on this occasion favour SACD: that's not a universal finding but Arcam does make a case for SACD's higher resolution, with just a hint more precision across the board. We've been complimentary about a good few CD players in this ballpark recently and it's clear that standards are generally high. This particular offering, however, seems one of the most appealing in its class, not only because of the inclusion of SACD, but because its sound is both excellent overall and tastefully differentiated from the average. There will never be such a thing as a CD player for all tastes, but this one seems likely to satisfy more than most.